Venus and Earth have long been thought of as sister planets. 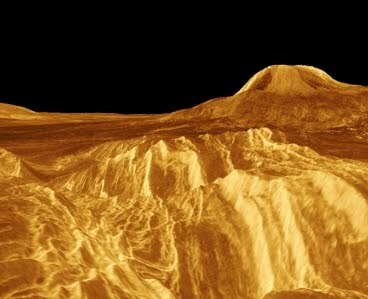 Given its similar size and proximity to Earth in the inner Solar System, Venus might seem like a promising candidate for having a surface that evolves through a tectonic process similar to what occurs on Earth, where rigid plates slowly shift across the underlying mantle. But a recent analysis by Peter James, a graduate student in the Department of Earth, Atmospheric and Planetary Sciences, highlights the fact that Earth’s plate tectonics seem to be the exception rather than the rule for rocky planets like Venus, Mars and Mercury. James provides new evidence that the generation and recycling of the surface on Venus occurs through a process that is actually quite different from what happens on Earth. His finding supports a theory that first arose in the early 1990s, when NASA’s Magellan spacecraft orbited Venus and took radar images of the planet’s surface. Before Magellan, most scientists assumed that the surface of Venus was influenced by some form of plate tectonics or volcanism. The Magellan images revealed a distribution of craters that suggest that most of Venus’ surface was formed around the same time — about 500 million years ago, which is young considering that the planet’s age is estimated at about 4.6 billion years. As a result of this uniform age of the surface, scientists hypothesized that the Venus surface is not made of moving plates like Earth, nor is it inactive like the moon. Instead it evolves through a periodic resurfacing process, possibly caused by volcanic activity. Geologists study features of a planet’s crust, such as its thickness and composition, for clues about that planet’s history. These clues shed light on the physical processes that made the crust, which is usually produced by partial melting of mantle material. To study Venus’ crust, James used gravity and topography data collected by Magellan between 1990 and 1994. Analyzing these data, James mapped the thickness of the planet’s crust, which he calculated to be about 30 kilometers (Earth’s is about 20 kilometers, on average). He could identify regions where Venus’ convecting mantle is pushing or pulling on its crust as the planet cools. While these results provide a better picture of the Venus crust, what is most compelling about the analysis, which James presented on March 1 at the Lunar and Planetary Science Conference, is the discovery that there are no large mass concentrations, or “mascons,” buried beneath the surface of Venus. Existing on Mars and the moon, mascons are gravity anomalies that correspond to large craters and basins created billions of years ago by massive impacts from large meteoroids. These mascons exert a slightly stronger gravitational pull — detected by spacecraft or satellites — than that of a smooth surface. While the process of mascon formation is not well understood, James explained that the extra gravitational pull likely comes from two sources: dense rock in the craters from volcanic flow and the placement of denser mantle material near the surface. James expected to find remnants of these crustal structures on Venus, given that they are prominent features on Mars and the moon. He believes that the absence of mascons is consistent with the idea that the Venus surface experienced some sort of “catastrophic overturning” at least 500 million years ago. “If the mascons were erased in the event 500 million years ago, that would require a mechanism that more thoroughly reworks the crust,” he explained. Brown University geologist Marc Parmentier agreed with James that the lack of mascons indicates that some sort of mechanism — perhaps large-scale volcanic activity — periodically creates a new surface on Venus. He praised the analysis for ensuring that research about Venus remains an active area in planetary science, which is currently heavily focused on Mars and the moon. “His work lets us continue to address one of the questions of Venus, which is how this so-called resurfacing process took place,” he said. James hopes to address this question in future research by using more finite element modeling to understand how mascons are formed and evolve. He said that NASA’s upcoming GRAIL mission to the moon will gather unprecedented gravity data that will provide some basis for comparing the lunar and Venus crusts.